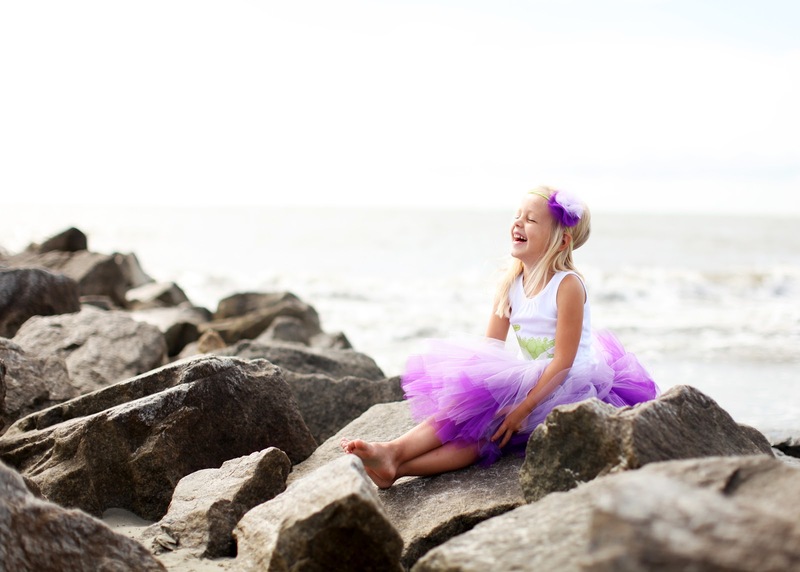 Adele Lee Photography: I adore Adele, and she just knows how to capture a moment. Her photos are crisp and clean, so vibrant. She has a talent, a love for photography and is the sweetest Southern gal you could ever meet. She can make your child smile and look natural in every.single.photo! We were so so lucky to have Adele capture the moments of this party. If you live in NC or SC, be sure to contact her, simply amazing. She has captured pictures of my daughter that have literally made my eyes water. 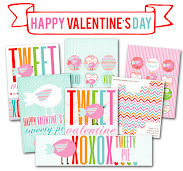 Sweet Mady Paper + Gifts: What an amazing party shop, filled with so many goodies. Michelle, the owner is beyond sweet and offers fantastic customer service. She provided the cutest favor bags for our party, fabric bags that were personalized. OMG BEYOND. Each child took home a bag filled with goodies, with their name on it. Talk about making each guest feel special. The quality of each bag was amazing. The best party favor ever. You must head on over to her shop, like right now! Sweet Temptations: This is our second time using Sweet Temptations. Janet Cristina, as sweet as her chocolate, offers the most fantastic chocolate covered oreos. Treats so adorable you just can't imagine. When I opened my sweet package my jaw dropped, a box filled with the most fabulous goodies, color coordinated for our event. The chocolate treats were so perfect, not a blemish on them. Parents and kids alike simply loved these. Polka Dot Market: WOW... what a shop! 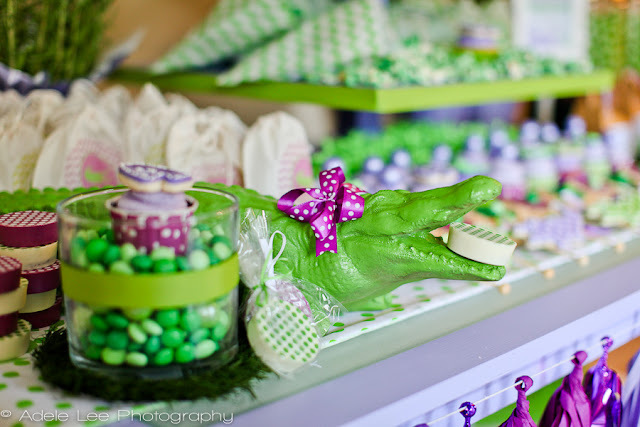 Polka Dot Market provided some serious cuteness at our Polka Dot Croc Party. 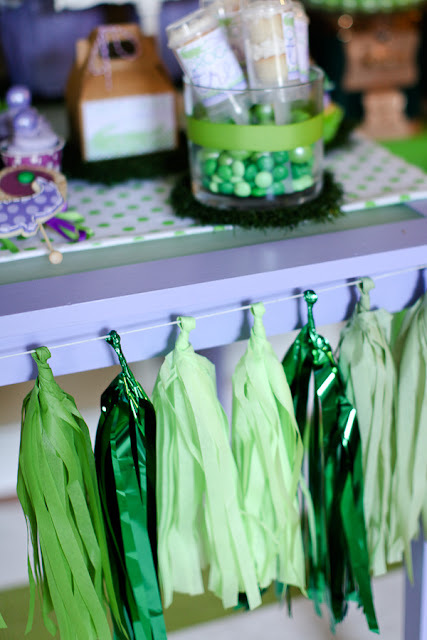 Fringe garland, cupcake wrappers, mini purple poms, party hats and the cutest purple gumballs. Not to mention Sally, an amazing shop owner. Speedy email replies, fantastic customer service and super fast shipping. I can't say enough nice things, really! The Flair Exchange: Carmen is one talented lady, who has been a featured vendor at every single one of our parties. I adore her and her creativeness. Her tassels are beyond amazing, and really added so very much to our party. The balloon tassels, WOW were awesome and the balloons were huge, crazy fantastic. A go to shop ten times over. Honestly, so so beyond amazing. Cookies are my Canvas: Nothing short of the most amazing cookie artist, a true gem. Christina takes your vision and makes it an edible delight. I even saved a cookie for after the party (SHHHHH), I just could not resist. I had to look at it 20 times before I took a bite, but when I did... OMG yummy! 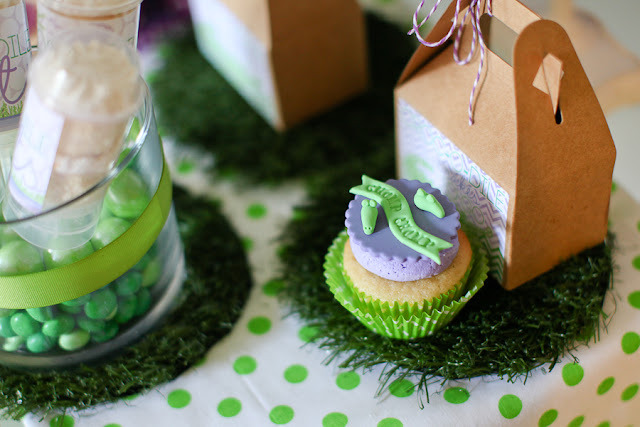 Her sugar cookies are true works of art and can match any party theme, now that is talent. Sweetest shop, and my go to cookie lady. Lynlee's Petite Cakes: We have been lucky enough to have Lynlee as a featured party vendor at almost all of our parties. I say lucky, because boy oh boy is she famous. Her fondant toppers are featured all over the web and anyone who knows fondant, knows Lynlee. She is also a sweet treats artist and beyond talented. She creates fondant toppers to match any party theme and is a total rockstar. Her customer service is also fabulous and she is oh so sweet. Sofies Big Day: Gosh, was I lucky I stumbled upon this cute shop. Nicole hand stamps wooden utensils, perfect for those big cupcakes or yummy sweet treats! The kids and adults loved these little spoons, which were oh so fun and very affordable. Stamped with a purple "happy birthday" to match our party colors. My Two Sweets Boutique: I can't thank DeeDee enough for making Charli P's tutu, bow and coordinating t-shirt, the crocs bow and AND the polka dot table runner. WOW, is this lady talented. I told her I wanted an ombre purple tutu and items to match the party theme. She not only came through, but blew me away. I was so blown away by Charli's outfit, it literally brought tears to my eyes. If you are looking for coordinating party outfits, this is your lady. 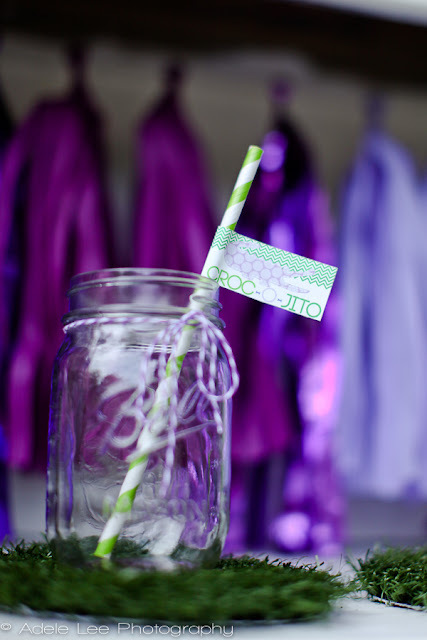 CupKates Event Design: Balloons, Push Pops, Straws, Wooden Candy Sticks, Cupcake Wrappers, Nut Cups... this shop has it all and then some. I love love love this shop and you should too! The sweetest shop owner, fast shipping, great variety and fab customer service! Thank you for all the amazing party goodies, hands down adore everything you offer. Pinhooks: Hangable push pins?!? AH-MAZING! I honestly don't know how I would have decorated the wall without them. 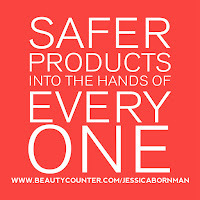 They come in a variety of colors and are so easy to use. 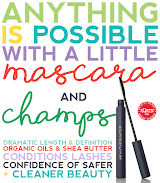 Great product, super inexpensive and simply love love love. A H.U.G.E thank you to all these amazing vendors. I honestly can't say enough nice things about each and every shop featured, which is why they deserve there very own post. Life happens, passes us by every single day. If we don't stop to celebrate special moments we may forget them. Whether your parties are big or small, they are moments your children will remember. Yummy treats, cute outfits, special party favors, pictures to capture it all! 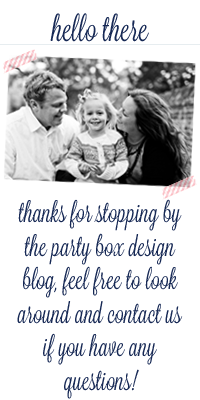 Hello Party Box Design Fans! It's me again...Shara from Little Gray Table. Sorry I haven't stopped by recently. Summer has been busy. Jess really wanted me to share with you my latest project so here you go! 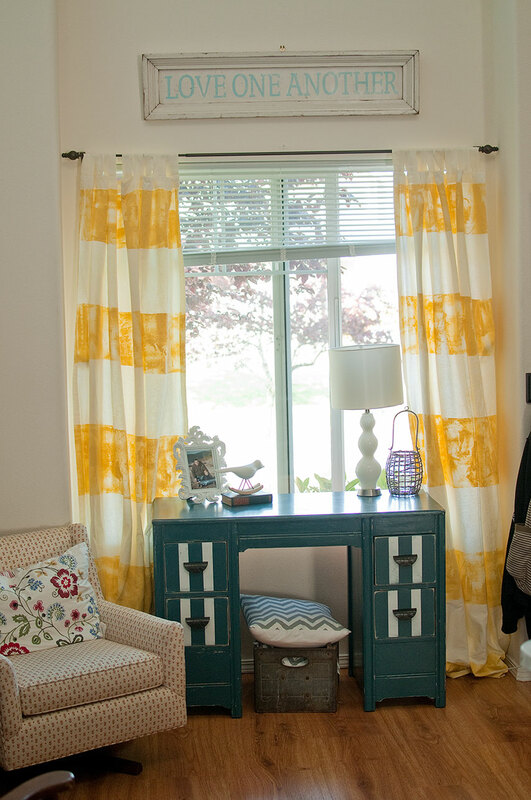 So, you've probably seen the bazillion pins on Pinterest with striped curtains. 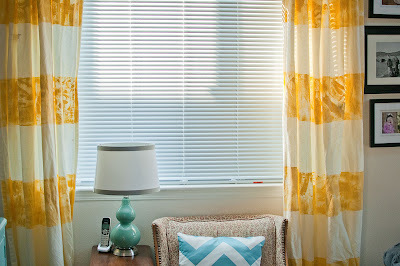 I decided to jump on the stripe curtain bandwagon. I've been thinking about it for awhile but was indecisive about what color to do. I debated between gray, aqua, red, and yellow. I have a lot of gray and aqua furniture and red accent pillows but only a touch of yellow so I finally chose yellow. 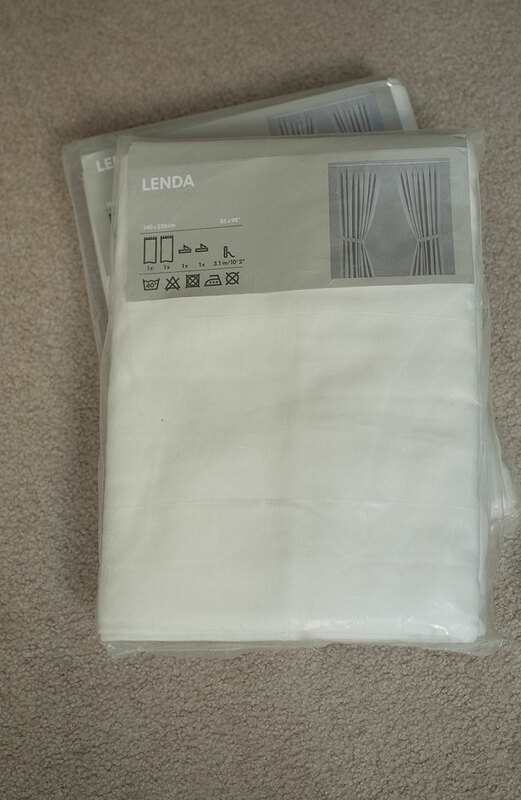 I bought the plain white, tab top Lenda curtains from Ikea a couple months back. These were a great deal at $19.99 per package of 2 panels. I need 4 panels for my living room so cheap was the way to go. 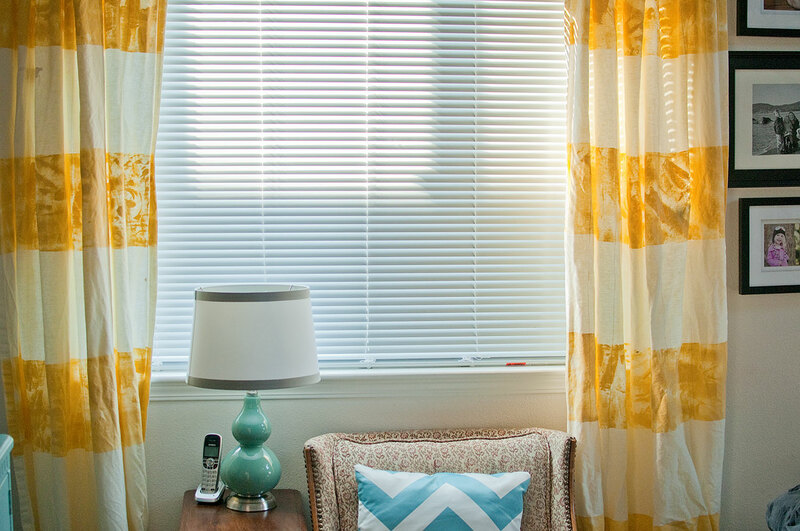 Plus I love Ikea curtains because they are so long that you can hem them to fit your space. I searched several craft stores for fabric paint but all the yellows I found were too lemony or too neon-ish. I wanted a warm yellow so I decided to use chalk paint. I picked Ce-Ce Caldwell's Carolina Sun Yellow. 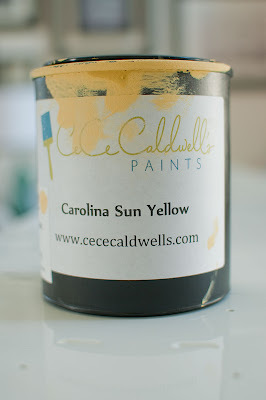 Chalk paint is amazing in that is can adhere to any surface. I does not crack like latex paint when you use it on fabric. It gives it almost a canvas feel and after washing it, it feels soft just like cotton. I decided how many stripes I would need. I wanted to start with yellow and end with yellow so I went with 5 yellow stripes per panel. I measured approximately 10 inches per stripe. I fudged a little because when they are hanging up, it's really not that noticeable if it is slightly off. 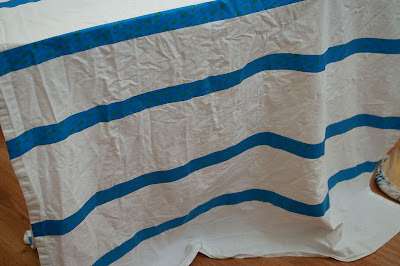 Once I taped down the stripes on the first panel, I placed the next panel on top and measured the stripes off of the first one so each panel would be consistent. Once all the panels were taped, I started painting. 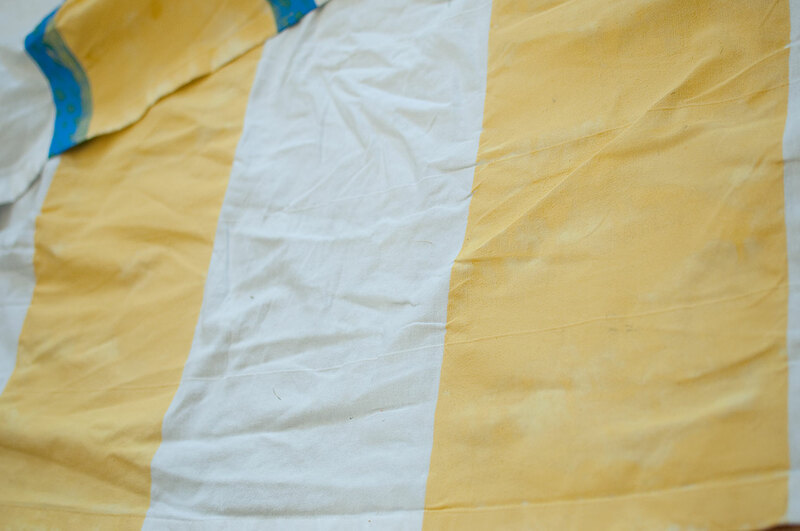 The chalk paint goes on smoothly but it takes a long time to achieve coverage on each stripe. I only applied one coat on each stripe. It gives it more of a faded, beachy feel instead of perfect, precise color. So beware of that if you do decided to use chalk paint. I'm liking the pop of yellow in the room. I'm a little disappointed that they turned out so splotchy. The color seemed even when I was applying it so I 'm not sure what happened. I think I will grow to love them though. I do need to raise my curtain rods higher up (they were here from the previous owners) and I need to hem them. It's definitely a project I would do again but it did take me a lot longer than I had planned. Sometimes projects don't quite work out the way you envisioned but that's the fun of crafting. I like playing with new materials and seeing how they work together. Overall, I like them. What do you think? Stop by my blog for other fun projects! I'd love to have you along for the ride! Hello again fab Party Box Design readers...I hope everyone has been enjoying their HOT HOT HOT summer! I've been in a state of constant melting, but other than that it's quite lovely! I'm here today to talk about mustaches. Obviously. Unless you've been under a party rock, you know that the 'stache has been dominating the party scene for the past few years, and it's showing no signs of stopping! And why would it? 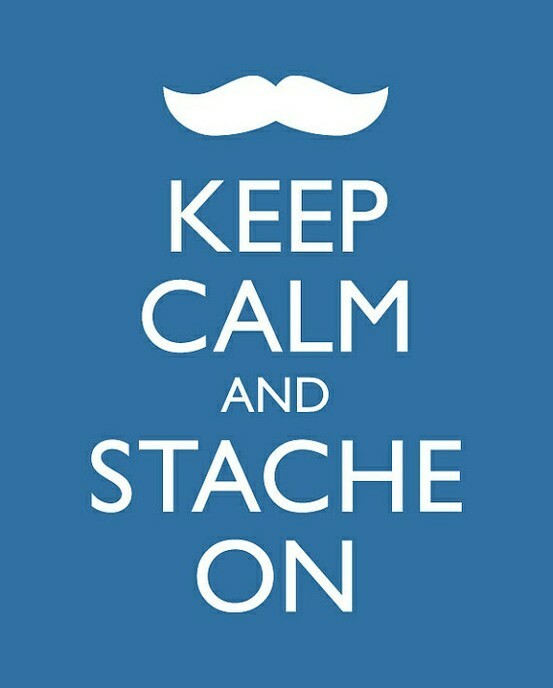 Mustaches are fun and fancy free. I'm sold! 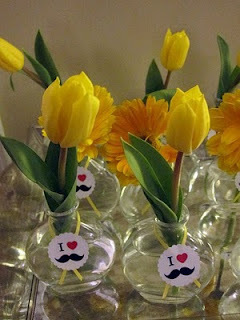 A few years ago (because I'm a bit of a trendsetter...not really, I'm just being a braggart), I loved the 'staches so much I threw my mom her very own 'Stache Bash. Below is a picture from the bash and you can read the whole post HERE! 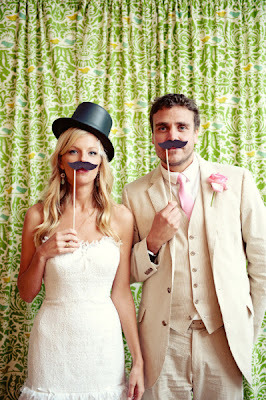 A few weeks ago I had wrote a post for Tablespoon that involved ...you guessed it...Mustaches! 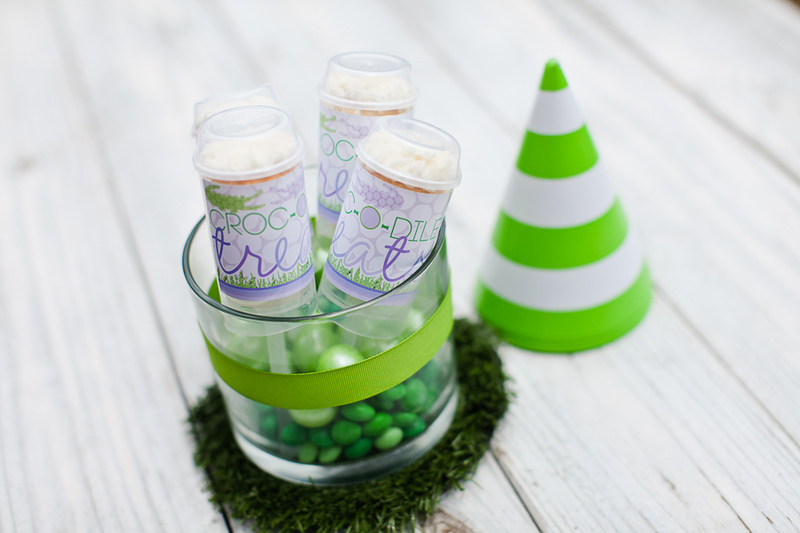 This time they were on a stick and used for Bridal Shower favors. Mustaches are for the Grooms Side and Lips are for the Brides Side. Fun, right? You can find out where to buy the molds and more info HERE! 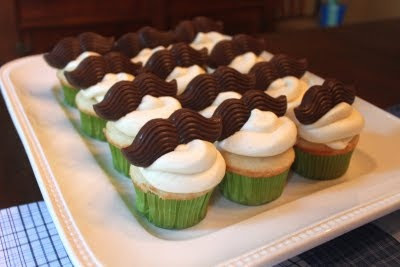 You could use mustaches to dress up your cupcakes. 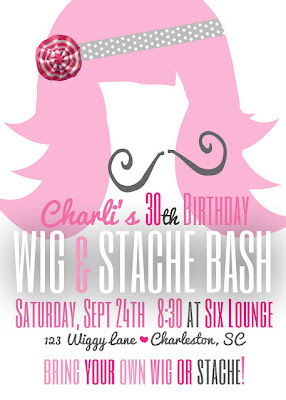 Our very own Jess from Party Box Design has a fantastic Wig & Stache Bash invitation suite that would be perfect for a fun 'stache party! Always respect it. Like Aretha said. 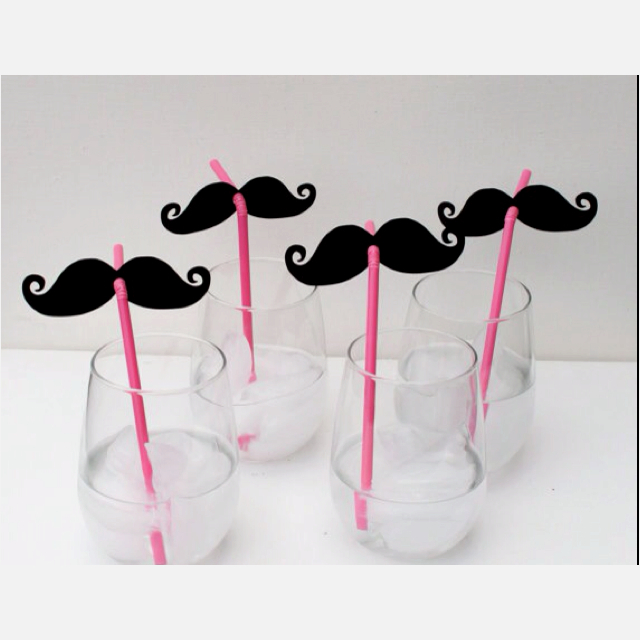 So if you're looking for a unique party theme, try a 'stache on for size! Until next time PBD readers!